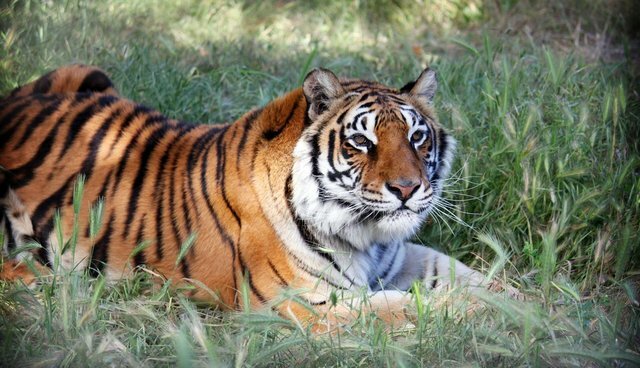 It was 10 years ago that the California-based Performing Animal Welfare Society (PAWS) undertook the largest big cat rescue in U.S. history, saving 39 tigers from certain death in a pseudo-sanctuary called Tiger Rescue in Colton, Calif. The tigers had been confined in shocking conditions and were barely clinging to life at this facility that once offered tours to the public and a chance to have their photo taken with a baby tiger. Little did anyone know the suffering these big cats endured for their amusement. The California Department of Fish and Game first seized 10 tigers from Tiger Rescue in November 2002 after finding them malnourished, without water, and living in filthy cages. Officials suspected owner John Weinhart of illegal breeding. Only after raiding Weinhart's home in April 2003 did agents discover the real extent of the death and suffering: Authorities seized 13 young tigers but they also found dozens of decaying and skeletal big cat remains on the grounds. Another 58 dead tiger and leopard cubs were discovered in a freezer. A veterinary professor later testified at trial that at least four of the cubs had starved to death. 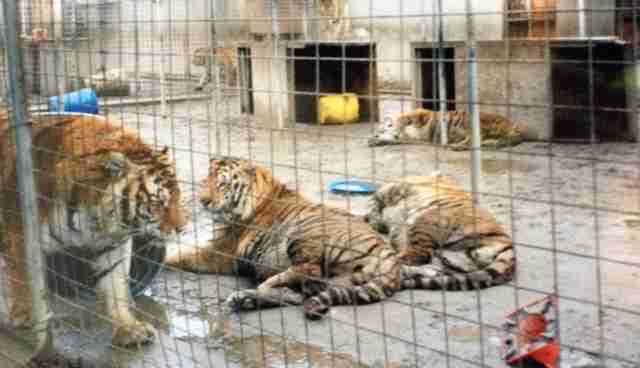 Tigers in deplorable conditions at Tiger Rescue in Colton, Calif. 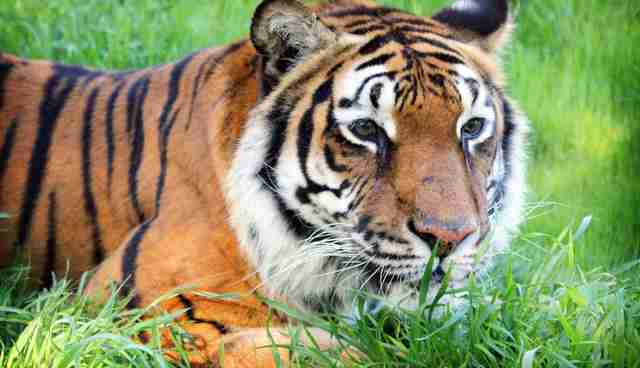 The State seized control of Tiger Rescue and 54 remaining big cats. Weinhart was later convicted on animal cruelty charges and child endangerment for keeping tranquilizers and live alligators within reach of his young son. He received two years in county jail (with 204 days credit for time served) and five years of probation; he is barred from keeping animals. In the meantime, it was up to animal protection organizations to clean up Weinhart's mess and tend to the ailing tigers. The Fund for Animals, which had been authorized to care for the animals, found homes for 15 tigers – leaving 39 cats in need of refuge. 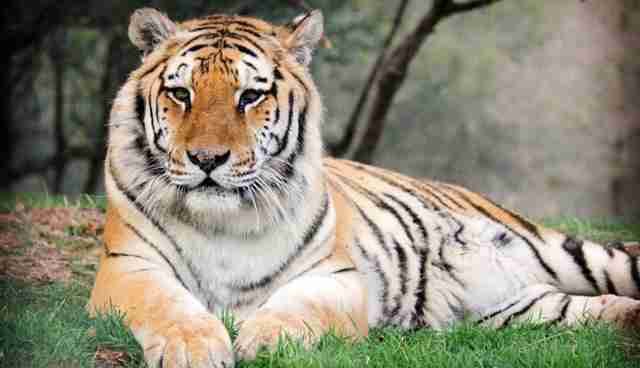 Sanctuaries around the country were at or near capacity, and most zoos did not want tigers of unknown genetic origin. "The scene at Tiger Rescue was horrific," recalls PAWS president and co-founder Ed Stewart. "There were so many sick, injured and neglected tigers that needed intensive care, rehabilitation and a permanent, healthy home. PAWS just had to step up and help these animals." PAWS committed to taking the remaining 39 tigers, but first had to construct a specially designed facility that provided grass, trees, swimming pools and room to roam. Transport of the tigers took place over an eight-month period, with six 400-mile journeys to PAWS' 2300-acre captive wildlife sanctuary, ARK 2000, in San Andreas, Calif.
Tiger habitat at the PAWS sanctuary in California. 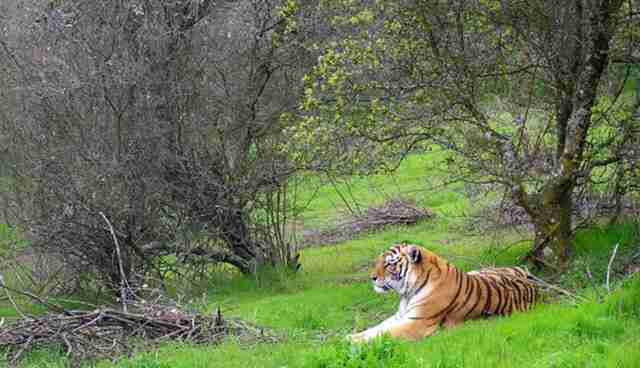 "These tigers had never walked on grass before," said PAWS veterinarian Dr. Jackie Gai. "It was incredibly touching to see them quickly adapt to their new, natural habitat home and to behave like tigers should for the first time in their lives." Today, 18 remaining tigers continue to enjoy a spacious natural habitat enclosure. Many of the big cats have since died from age-related conditions. PAWS estimates that it has cost more than $3.75 million for housing, food, staff and veterinary care for the tigers, who continue to require specialized treatment. The non-profit organization relies on private donations to help support care of the animals. Mookie "There is only one answer to the horrible exploitation of captive big cats that takes place across the country today, and that is to stop the breeding of these animals," concluded Stewart. "There is no excuse for using big cats for entertainment, media appearances, photo ops, or as someone's ‘pet.' It's all a recipe for unspeakable suffering." Across the U.S. there are countless private owners exploiting big cats for profit. Like Tiger rescue, many offer photo opportunities with a baby tiger or lion cub. Others provide baby animals for television shows like The Tonight Show Featuring Jimmy Fallon, which recently featured a white tiger cub (these animals suffer terrible health conditions from inbreeding). After a short time, the cubs get larger and can no longer be used to turn a profit. The cats are then discarded and sent to roadside zoos, private menageries, or to be slaughtered for the exotic meat industry – and more cubs are bred to feed this unending cycle of misery and death. If there is one lesson learned from the Tiger Rescue debacle 10 years ago, it's that we need to remain vigilant when it comes to the health and welfare of captive big cats – there is still much work to do! Tell friends and family to avoid drive-through parks, roadside zoos and circuses – or any facility that benefits from the captive breeding and exploitation of exotic animals for entertainment and profit. Never participate in a photo-op with a wild animal, no matter how young, in the U.S. or any other country. Beware of "pseudo sanctuaries." Signs of a pseudo-sanctuary can include: breeding animals, selling photo sessions with them, allowing public contact with wild and exotic animals, using them for television appearances and at fundraisers, and opposition to laws that would restrict the private ownership of exotic animals. Always look for Global Federation of Animal Sanctuaries (GFAS) accreditation to ensure a sanctuary is adhering to the highest standards of care and welfare. Work to ban the possession of exotic pets in your city or county, if no such laws exist. Don't buy into the conservation myth that breeding exotic animals helps preserve species in the wild and therefore justifies captive breeding and confinement. Real conservation is about saving wild animals where they live!